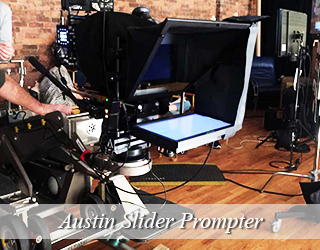 Our professional through-the-lens teleprompters sit in front of a camera lens, allowing talent to read the script while staring directly into the camera. We strongly recommend that the operator be given the script in Word format before the shoot even though operators have the capability to load a script rather quickly and if necessary make minor edits on the set. The Interrotron Mark III contains a director’s unit and talent unit. This allows the talent and director to look at each other while looking into the camera at the same time. 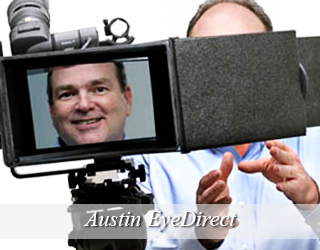 The EyeDirect functions like the Interrotron, but it is a low-cost, portable unit that can also double as an iPad prompter. The Presidential Teleprompter consists of two glass panels that are placed on either side of a podium. For more information, click on the button below. 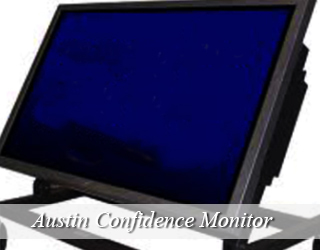 The Confidence Monitor is an alternative to a Presidential Teleprompter. It’s useful for presenters who do not wish to stand at a podium to address the audience, but instead, walk around the stage. 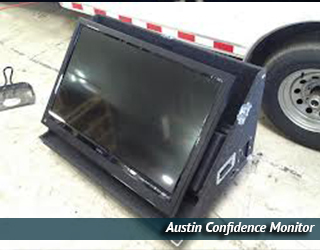 The Confidence Monitor can be placed onstage, offstage or even at the back of the house. 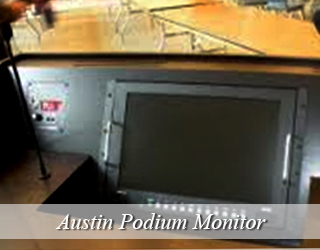 To discuss the right Confidence Monitor setup for you, give us a call at 917.414.5489. This item is available for shipping only. The unit sets up in less than two minutes and can be mounted to a small lightstand or baby C-stand (not included). 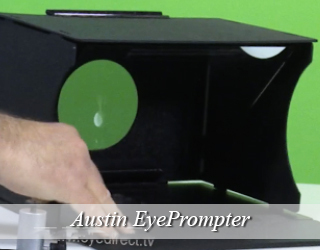 For more information, visit the EyePrompter Rental Page. The Podium Prompter is a thin Teleprompter Monitor placed on top of the podium. To the audience, it appears as if the presenter is glancing down at notes, however, he/she is not burdened with shuffling papers while delivering a speech. I am elated to be in Austin. I accepted a friend’s invitation to stay rent-free at her place a few weeks before the much-anticipated SXSW Film Festival in early March. The American Movie Company whose main office is in New York has sent me here to join their local staff. 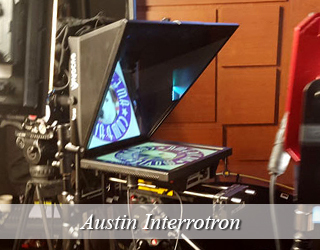 I will be wearing many hats both as a production office coordinator and as a seasoned Teleprompter Operator. In March, gear up for the gig of a lifetime and head towards South by Southwest Music Festival in Austin, Texas. The city extends its welcome to you and a target audience of at least of 70,000 industry professionals, if past years are an indicator of things to come. 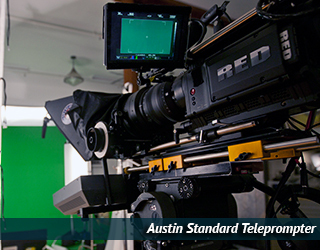 Austin gained fame worldwide for live music and has become an increasingly respected film and arts scene. You need to be at this iconic global music-and-more industry event. If any of these strike your fancy and are your passion, you won’t want to miss out. More than 60,000 attendees jammed this music mecca in 2015. Austin had everything, including more than 200 live-music venues, and has only improved in the three years since I last attended SXSW. An interesting statistic – This year, US News named Austin as the #1 most livable city in the country. I questioned the accuracy of such a claim, but there you have it. The event is wild, passionate, well organized and turns the city upside down, residents say. They love it. For anyone connected to the music or entertainment industry, SXSW is a must! Think of it as an investment. How do you get the most from your event dollars? Follow these pro tips and up your game. Reserve your equipment NOW. 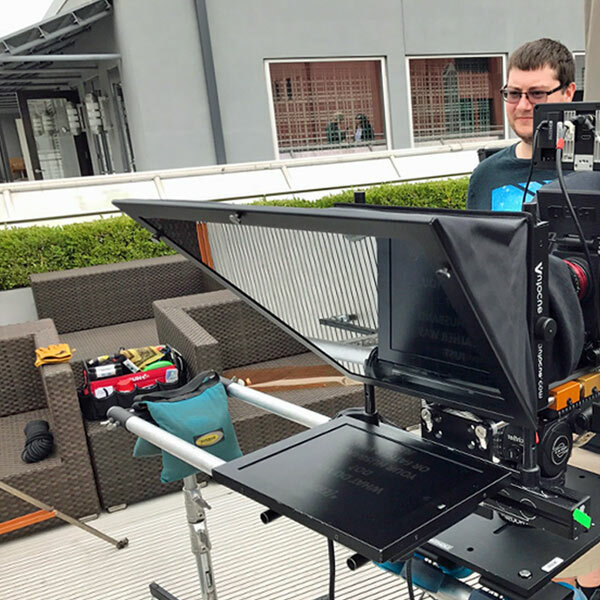 While global outfits like the American Movie Company and its subsidiary TeleprompterRental.com will be providing performers with must-have-gear such as Teleprompters, Confidence Monitors, etc. you will want to secure your crew and critical supplies ASAP. Increasingly, singers rely on Confidence Monitors, devices that scroll lyrics, the set order and anything else the performer needs to remember. Said unit is set unobtrusively onstage, and blends in with amps and other electronics on the stage. Only the performer sees the crystal clear screen. This removes the possibility of cringe-inducing moments when lyrics are forgotten. What if you are making a pitch to an audience of potential investors, clients or partners? If you are a pro, you already know this, but it bears repeating for newbies and the less experienced. There are different types to fit your needs. Consider the standard through-the-lens unit or the Presidential Teleprompter. You can free your mind to connect with your audience without worrying about what comes next. And YOU set the pace. 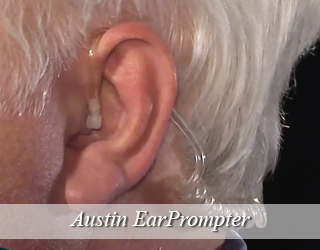 Your professional prompter operator is there to follow you. It’s like a dance where you are always leading. Whatever your goal at SXSW, remember to get professional video of your appearances. Use the video to promote your business and career. Put it on your web site. Make it part of your digital portfolio. Post it on Facebook. Make it the foundation of a documentary about you. Don’t miss the chance to get top-quality video you can cut and re-cut to get the most out of resources you have committed at SXSW. I am over the moon to be here and to be part of this incredible event. Named after Stephen F. Austin, who was the “father of Texas” and located in Central Texas, Austin is the fastest growing city in the United States. Austin was ranked as the best place to live in 2017 and in addition, it is the second safest city. Austin is known as “clean city air” because it has a no smoking policy in public places and buildings. The city is also known for its bodies of water and its beautiful parks. Fun fact there are 50 swimming pools in the city of Austin that are open to the public. “Keeping Austin Weird” is very important to the people of Austin and it allows them to show Austin’s diversity within the capital. The city is made up of college students, blue-collar workers, government employees, tech workers, musicians as well as a large LGBT community. There are many things to do in the city such as going to coffee shops, restaurants along the river, food trucks and festivals. If you want something more athletic, Austin is bike friendly and a cruise along the river is always relaxing. Austin, Texas also has a large theater and live performance presence. Some well-known theaters are the Paramount Theatre and the Zachary Scott Theatre Center. Chloe Cameron is a trained actress. NYU MFA Dramatic Arts, LAMDA . (London Academy of Dramatic Arts) . L’Ecole Dramatique, Leon, France. Chloe will help your talent to perform better either with or without a teleprompter. She will help the speaker gain confidence and deliver a persuasive speech with elan!. Chloe is a polyglot fluent in French and English and has a general familiarity with Spanish. Contact Bill at 917-414-5489 for speech coaching and other services. Pictured on the right is a new addition to my household. My friend in Italy could no longer care for Timtim. I adore him! 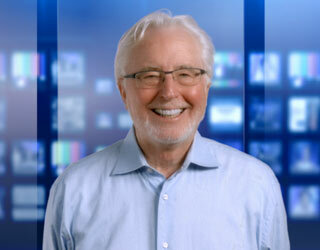 Hugh Donaghy is our friendly office manager in Austin, TX! Ever since he was a kid, he dreamed of being on set, though as a child, he wanted to be an actor like John Wayne. Later, in college, he discovered that his true passion lay behind the scenes. 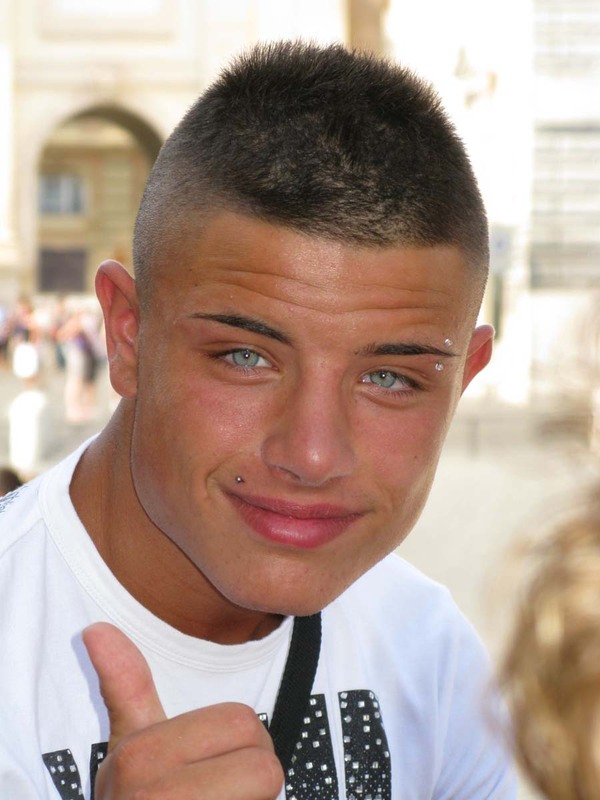 Production managing became his main interest, and he has worked on several short films and indie features. 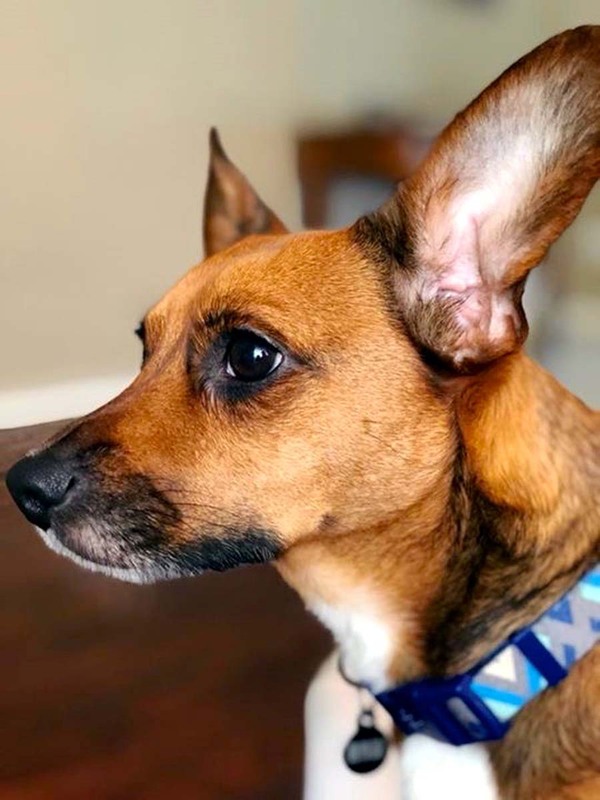 More recently, he became a member of AMC’s Austin office staff, where he puts his skills to use in keeping everything ship-shape! Energetic and kind, we’ve loved having him work with us. Angela Rivera has worked with the company as a prompter operator since 2015. She graduated from University of Texas in Austin with a degree in Radio-Television-Film. Angela loves to write and produce short documentaries. She once took a 3 month trip to drive across the nation and capture the country’s natural beauty. When she’s not on set, Angela can be found watching sports, getting ready for a good barbecue. 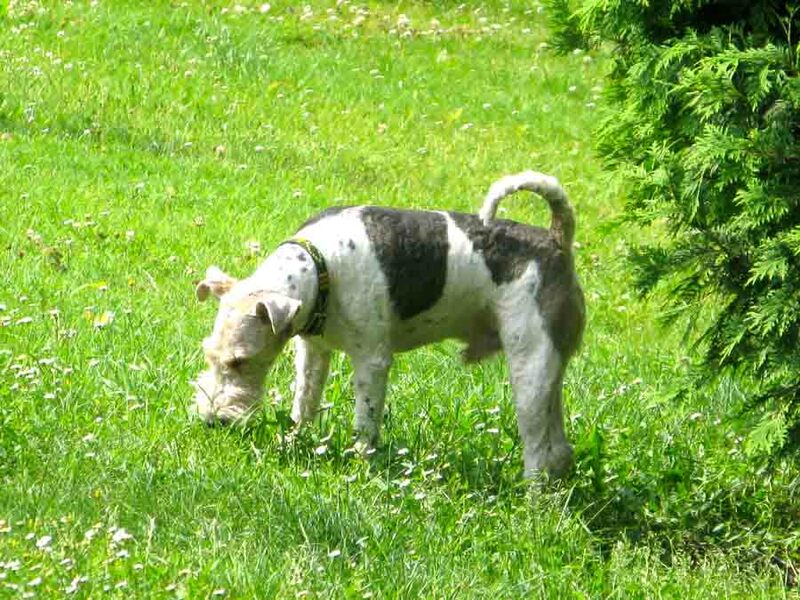 She is also the proud owner of Rocky, a grumpy yet loving dog who loves to lounge around. I turned 21 today! The best present I could’ve ever asked for was getting promoted at my job here at The American Movie Company. OMG!!!! I’ve been working here for two years and I love it. The staff feels like family. Who else hosts cupcake Fridays and lets you bring your dog to work? I was just promoted to teleprompter operator. I’ve worked hard to get here and put in over 500 hours to learn the ins and outs of the craft and the skills required. I may be young but I am dedicated and very focused. I take my job and future career here very seriously. I know it’s a big deal when someone places their trust in my hands, literally. I appreciate their confidence in me. I am very proud of my accomplishments (I say with all due modesty) and my incredible team. We really are a family here. I feel so lucky. I’ve always loved film. From the very first time I went to the movies and the house went dark and the screen lit up I knew I just had to be a part of that magic. I just knew it. I felt it in my bones. My mom was involved in theatre at The Moody here in town. She was quite wonderful. She just can’t find the time anymore. (This doesn’t stop her from picking up the end of a broom handle and belting out Broadway Baby). I’m lucky to come from a whole family of creative people. I’ve worked on some amazing projects with this company. As a production assistant, and later as a production coordinator, I have juggled all kinds of tasks and have really learned how to navigate my way around a set. But, now I feel like this is my time to shine. Most of the operators here have pet names for their prompters. I do too! We are such an imaginative group of diverse people. I’m obsessed with politics and am proficient at mounting and scrolling the Presidential Teleprompters. Fingers crossed, I can, nah, I will be a part of the 2020 campaigns! These devices are used by politicians seeking the highest office in the land and by anyone giving a speech to a large group of people. I find it amusing that they are called “Presidential”. They give the impression that the speaker is totally in control and self-confident. The audience does not see the words scrolled on those glass panels. One of the reasons I love this job is that I get to meet such interesting people. Can’t wait to see where I’ll prompt next. The Austin Convention Center consists of 5 column-free exhibit halls, 7 ballrooms, and 54 meeting rooms. The convention center has placed host to a variety of annual conventions and festivals, including SXSW. 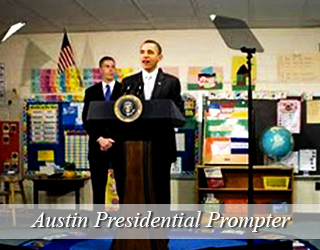 We supply Teleprompters, Presidential Prompters, Podium Prompters and Confidence Monitors at this venue.